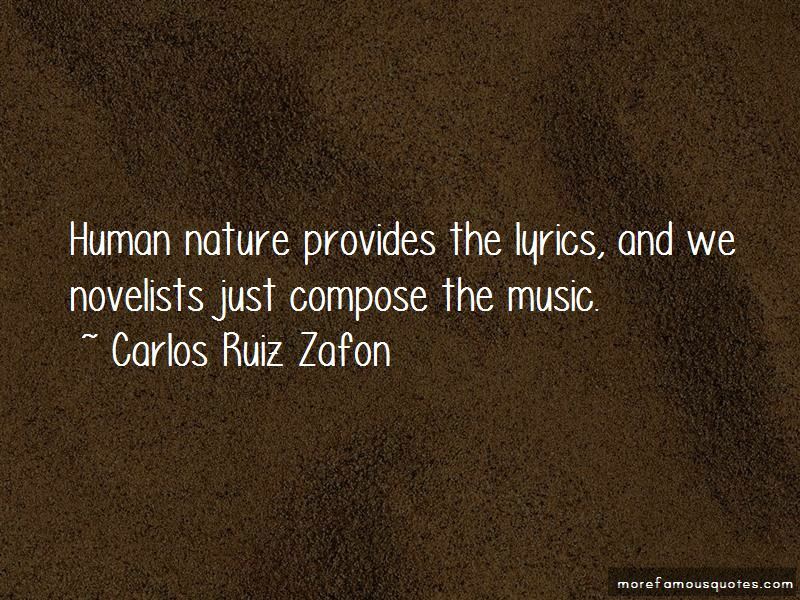 Enjoy the top 56 famous quotes, sayings and quotations by Carlos Ruiz Zafon. I spend a lot of time in L.A., and when it rains there you get the entire rainfall for the year in two days, raindrops the size of mangoes. And in Barcelona, the Mediterranean storms come up from the sea, thunder and lightning; it's like the end of the world. I've always thought that we are what we remember, and the less we remember, the less we are. In Los Angeles you get the sense sometimes that there's a mysterious patrol at night: when the streets are empty and everyone's asleep, they go erasing the past. It's like a bad Ray Bradbury story - 'The Memory Erasers'. You're as white as a nun's buttock. Are you all right? For some reason, I never felt the need to have kids. My wife feels the same. We don't feel a void. I don't think they would give my life meaning. I do think of the books as my children, though. Whatever is inside of me, I put into my books. I was always fascinated by the fact that you could take paper and ink and create worlds, images, characters. It seemed like magic. I don't care what happens in 100 years. I won't be around. You know, not every good book needs to be a movie, or a television series, or a video game. There's great work in those mediums, of course, but sometimes a book should remain a book. I still believe nothing tells a story with the richness and complexity of a good novel. 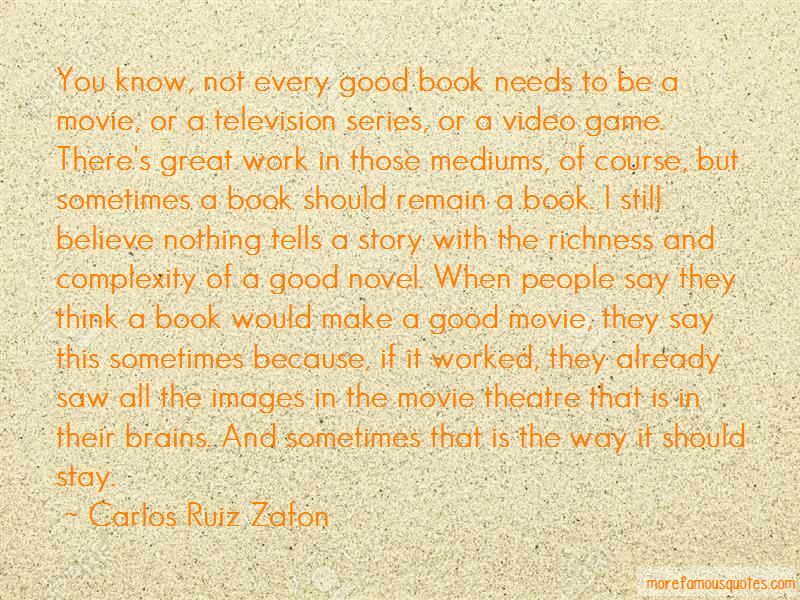 When people say they think a book would make a good movie, they say this sometimes because, if it worked, they already saw all the images in the movie theatre that is in their brains. And sometimes that is the way it should stay. One of my ambitions has been to go back to what those great authors were doing then ... to bridge that sensibility of old Victorian Gothic tales and reconstruct them in a modern way. A big success can be very confusing if it comes too early in your life. When you are young, you are more vulnerable to vanity. I was 36 when I wrote The Shadow of the Wind and the success of it was very gradual. If you have this kind of success straight off, I think there is a danger you can become an idiot, because you don't have a perspective. It hasn't changed me a lot. I fly first class now. But those things don't change you. If I am pretentious, I was before, I haven't changed. The only thing is, I am less anxious now. but I began to figure it out, and I'd read a lot of Stephen King paperbacks. I've always said he was my English professor. The thing is that my first novel, which was basically a mystery adventure story, won quite an important award in Spain for young adult fiction, and because of this it became a very successful book, and right now it's some sort of a standard title, it's read widely in many high schools in Spain, so I think, in a way, I was a victim of my own success in the field of young adult fiction, because it was never my own natural register. I never intended to write that kind of fiction, but I became very successful at it. Does the madman know he is mad? Or are the madmen those who insist o. Convincing him of his unreason in order to safeguard their own idea of reality? 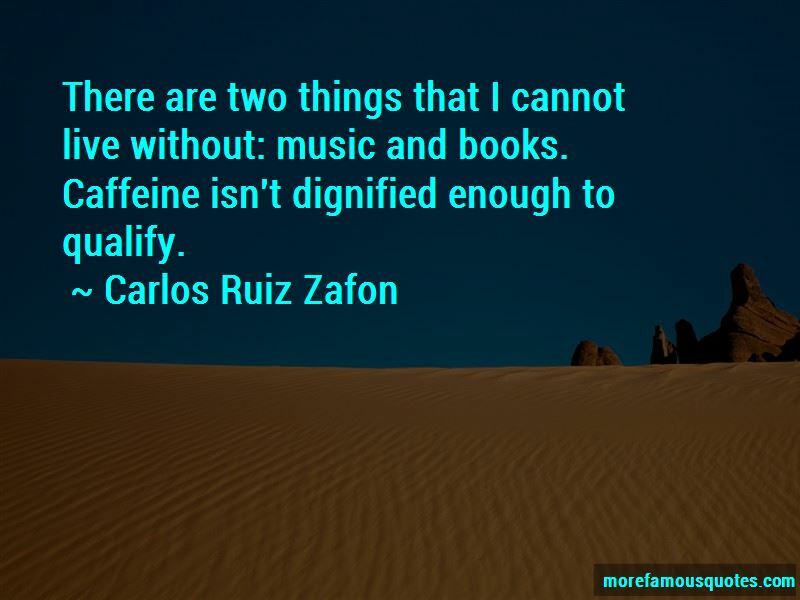 Want to see more pictures of Carlos Ruiz Zafon quotes? 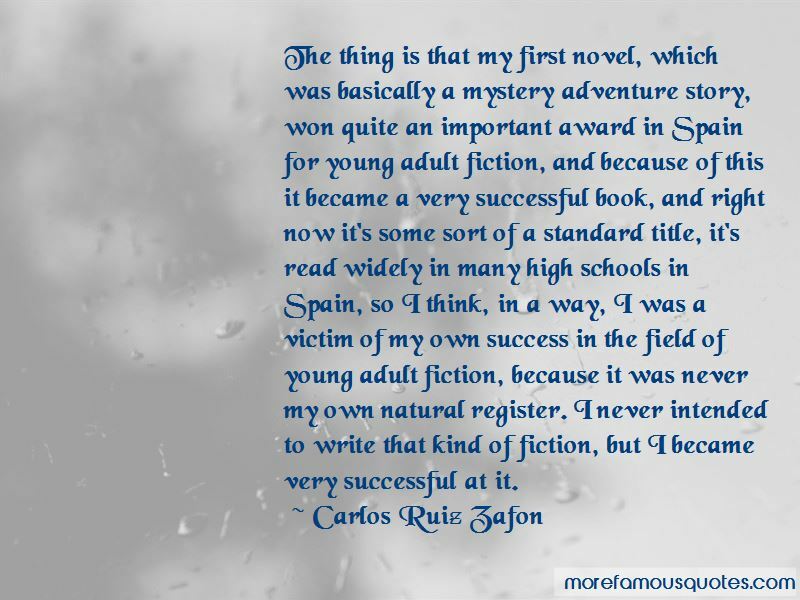 Click on image of Carlos Ruiz Zafon quotes to view full size.